Nollywood Releases Film About Evans,The Kidnap Kingpin. The life of the most wanted criminal in Lagos state has been reenacted by Nollywood film makers with some keen focus on his mode of operation and the his dual personality. A movie poster making rounds on social media shows his crime story has been acted and produced in two parts. 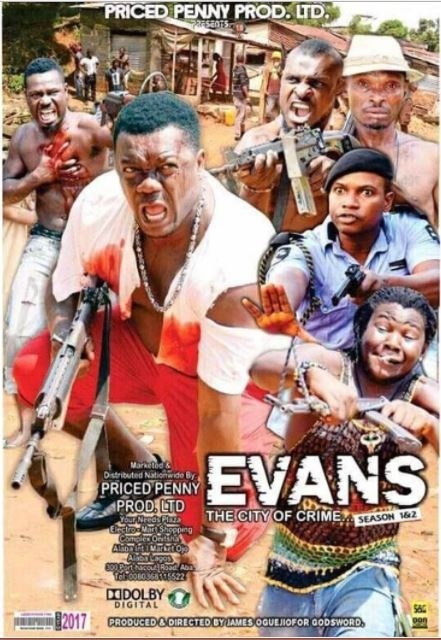 The film titled ‘Evans, The City of Crime’ details the criminal exploits of the Anambra native who collected as much as $1.2 million from one of his victims resident in FESTAC Town. The movie was produced by Priced Penny Production Limited and directed by James Oguejiofor Godsword. Evans is being investigated by the police after he confessed on television to some of the allegations made against him. He has since refused to be granted bail and insists on cooperating with the police. He is also scared that rival gangs or his former victims may be laying ambush to collect their pound of flesh.